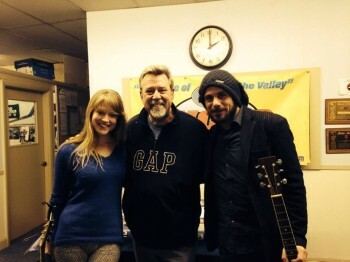 For Hingham’s Coffeehouse off the Square show to open the Thanksgiving season, Marina Evans and our own Eric Eldering Cornetta will be playing. The event is at 8 pm on Saturday, November 15, and starts with an open mic from 8 to 8:30. Come and be discovered. The coffeehouse is at the Old Ship Parish House, 107 Main Street, just a few doors up from the Loring Hall Theater in Hingham Square. Handicapped-accessible. Admission is $15.00 at the door and desserts and beverages are available. Proceeds benefit the Unitarian Universalist Service Committee. Volunteers (free admission) are always welcome. For information call 781-749-1767. Unbound reviewed in The Noise! My new album Unbound received its first official review this month in The Noise Magazine, and it was a great one — I am so honored! 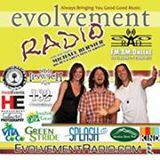 Reviewer Tim O’Brien took a very careful listen to the album, and made his commentary on everything from the songwriting to the arrangements, vocal performance, production, and even the recording quality. It’s both refreshing and encouraging to get such a positive response on literally *all* aspects of the record. Thank you, Tim and The Noise! Recipe for a superior CD: start with a charming songstress, blend hints of Amy Winehouse and Sara McLachlan-esque vocal stylings, add just a smidge of KT Tunstall, mix in a pile of well-crafted songs, and season with outstanding production. […] Marina Evans seems destined for a sure shot at the big time. 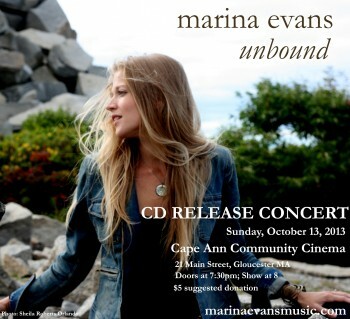 Cape Ann singer-songwriter Marina Evans will release her debut album “Unbound” at a special event on Sunday, Oct. 13, at the Cape Ann Community Cinema. The live performance will feature musicians from the North Shore as well as Bernardo Baglioni from Florence, Italy, where the album was recorded. The 26-year-old began performing on Cape Ann almost a decade ago, and has developed her skills in her hometown and across the country. While studying abroad in Florence in 2008, she began collaborating with Florentine musicians. She launched a Kickstarter campaign in April to raise money to record the album. With more than 200 donors, she met her funding goal and began recording in May. Doors open for the Oct. 13 event at 7:30 p.m. with the show at 8 p.m. The Cape Ann Community Cinema is at 21 Main St. in Gloucester. I was pleasantly surprised to find a great review of one of my live shows this past summer in this month’s edition of The Noise Magazine – many thanks to author and Noise founder T Max for his ongoing support! Click here to read the full review; scroll down, it’s about 1/3 of the way down the page!